First off sorry for the poor pic i had to use my phone again cause Kev has took mine to France for a week, he's gone fishing.While he's away I'm doing some decorating have you ever started summit and then thought WHY did i start this........so i took a break and made this card. I'm entering this in 2 challenges Just magnolia and a new one stampin for the weekend. 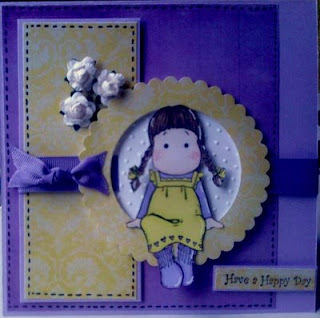 Stamping for the weekend was to make a card in Purple & Yellow and i followed the sketch at Just magnolia.The papers were a download and sorry cant remember where it's from, Tilda has been coloured using pro markers. Got my self both sets of the greeting farm's miss anya's yesterday so i cant wait to have a play with them. Ooooh gorgeous card hun, love the image and colours you have used! Fab take on the sketch too! Oooh sounds like you deserve a break from decorating! This is a beautiful card! I love your Tilda and how you put her sit in the circle and that great embossing behind her. The ribbon is gorgeous and I love the cute flowers you added. Wowee Shell you have rocked both challenges and you have coloured Tilda to perfection. Your bugged background looks fab and your papers are delish. Thank you for joining us on our very first challenge with such a beautiful card and we hope to see you back playing on a weekly basis. Good luck. Hi Shell, what a sweet tilda siting there in the circle.love the embossing you've done behind her. And such lovely yellow paper you've chosen. Love the bow you've done, everyone seems to be able to tie one but me....ah well. Thank you for participating in the "Stampin' for the Weekend" challenge. Good luck and we hope you'll continue to join in on the challenges on a weekly basis. Have a great weekend. This is such a cute card I love the way you have done some embossing behind her and the faux stitching. I don't blame you one bit for having a lil break, sounds like you deserve it, fancy you being left to do the DIY, whilst Kev is away....men.....lol!!! 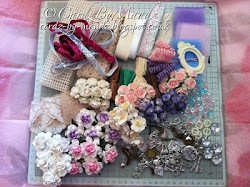 So pretty Shell, I love how you've coloured Tilda and the pretty rosebuds. A lovely card.Thanks for taking part in the 1st challenge at SFTW! I love this card especially the circle that Tilda is sat in with the embossing in the background. I'm having to use my very old camera at the moment and it's driving me mad! Thanks for joining in the first SFTW challenge, I hope you can join us again next week. Love this card Shell. I like the way Tilda is sitting on the edge of the frame you've made. Beautiful card, I love the colours and papers you used!